The US banking giant JPMorgan Chase has recently announced that it has taken a 9.12% holding in the Australian mining company Danakali. On its company website Danakali describes its main focus as the Colluli Potash Project in Eritrea which it owns jointly with the Eritrean National Mining Company. JPMorgan though is no stranger to mining in Eritrea, it already has a financial interest in the Canadian mining company Nevsun Resources who have a 60% interest in the Bisha copper and zinc mine in Eritrea. Since gaining independence from Ethiopia in 1993 no democratic elections have taken place in Eritrea and since then it has functioned as a highly dictatorial one party state under its President, Isaias Afwerki. According to a report published by the United Nations Human Rights Council in 2015 the Eritrean government was condemned for carrying out extrajudicial killings, torture, maintaining indefinite national conscription for its citizens, and many other crimes. All citizens between 18 and 40 are obliged to do national conscription and as part of their conscription many are forced to work as cheap labour in the private sector. In 2014 three former workers at the Bisha mine filed a lawsuit against Nevsun in the Canadian courts alleging that they and other Eritreans had been forced to work against their will as conscript labour in the mine. For its part Nevsun has strenuously denied that it knowingly employed forced labour in the Bisha mine. The question though of whether or not any western company operating in Eritrea profits from forced labour is hardly the main point. Whilst JPMorgan and other western companies are investing in Eritrea all they are really doing is helping to prop up its dictatorial government. 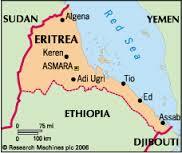 At the same time as western capital is going into the country, many Eritreans are going in the opposite direction. Faced with living under a dictatorship, faced with indefinite conscription and forced labour many Eritreans have chosen to flee the country. It has been estimated that about 20% of all refugees in the recent and ongoing exodus from Africa to Europe are Eritrean. Already a pariah state, Eritrea has been called the North Korea of Africa and many in the Eritrean diaspora are now demanding economic and other sanctions against the country similar to those against apartheid South Africa until there is genuine democratic change. Will JPMorgan, Danakali, Nevsun or other western investors pay any attention to these demands? Who will own South Africa's mines?